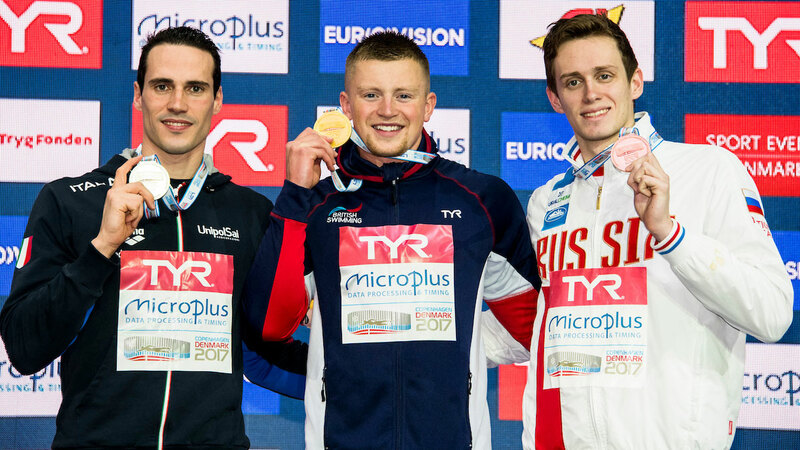 Olympic champion Adam Peaty won his first European Short Course title with a dominant performance over 100m Breaststroke in Copenhagen. Peaty, who is also World, Commonwealth and European champion in the long course pool, set a European record 55.94 to win the final in Denmark. The result brings Peaty his second medal of the Championships, adding to 50m Breaststroke bronze from the opening night. Ben Proud also won his second medal of the week on a successful night for the British team. “Finally I made it,” said Peaty, who was nominated for the BBC Sports Personality of the Year award for the fourth time this year. While Peaty was the biggest star of the field, he was only second fastest into the final, winning his semi in a British record 56.24 but trailing Russia’s 50m Breast silver medallist 56.02 overall. The Loughborough National Centre swimmer has readily admitted he is unrested for the short course meet, with his focus being on competing for Team England at April’s Commonwealth Games. But the 22-year old put in a typically powerful performance to claim his maiden short course title, second quickest off the blocks and first to the half-way turn in 26.06. He eventually put more than 0.2 seconds between himself and the field, with 50m Breast champion Fabio Scozzoli chasing him home for silver in 56.15. Prigoda was another tenth of a second back, taking bronze in 56.28 while Scotland’s Ross Murdoch was eighth in 57.51.